Travel articles about the literary side of New Orleans may mention Mark Twain’s observations about “stirring” Canal Street. Or point out Tennessee Williams’ several habitations. Or list the authors who frequented the Hotel Monteleone with its famous, moving Carousel Bar (Ernest Hemingway, Eudora Welty and Anne Rice number among the hotel’s notable visitors). These bookish/author highlights certainly piqued my interest. 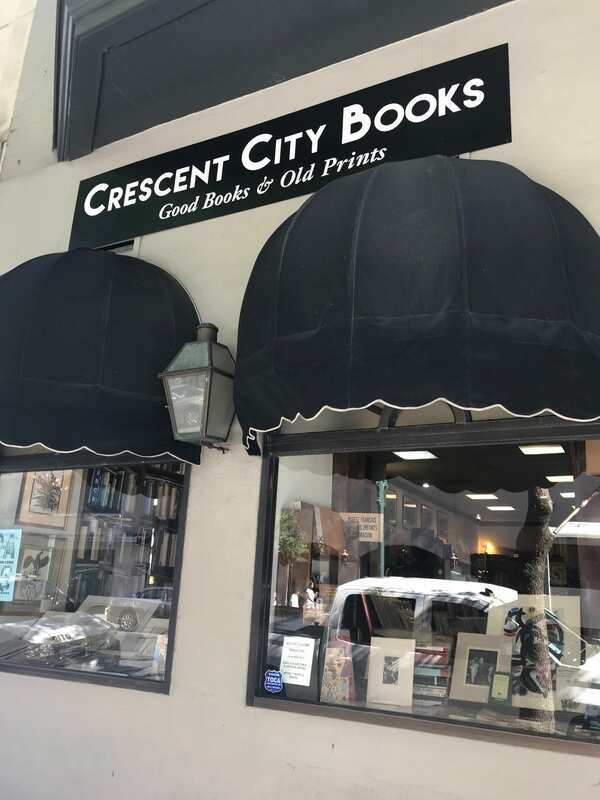 But during my visits, I discovered so many other Crescent City connections to the world of poetry and literature in this most storied of cities. Here some of those connections that I sought out or – even more fun – stumbled upon. Even if your visit doesn’t coincide with Mardi Gras, you can experience a hint of this famous, raucous celebration at Blaine Kern’s Mardi Gras World (1380 Port of New Orleans), a working, float-building site. The family-friendly program begins with a film detailing the history of Mardi Gras and the Blaine Kern company followed by an invitation to sample a slice of King Cake (tradition dictates that if you find the plastic baby charm in your slice, you’ll enjoy good fortune but must also host the next Mardi Gras party). Afterwards, you can become a character of sorts yourself – there’s a selection of sparkling festival costumes to try on for a spirited selfie. 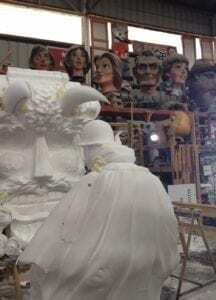 Next, a guide conducts a tour through the workshop where float-making artists practice their craft, before setting visitors loose to wander a warehouse full of dozens of finished floats. 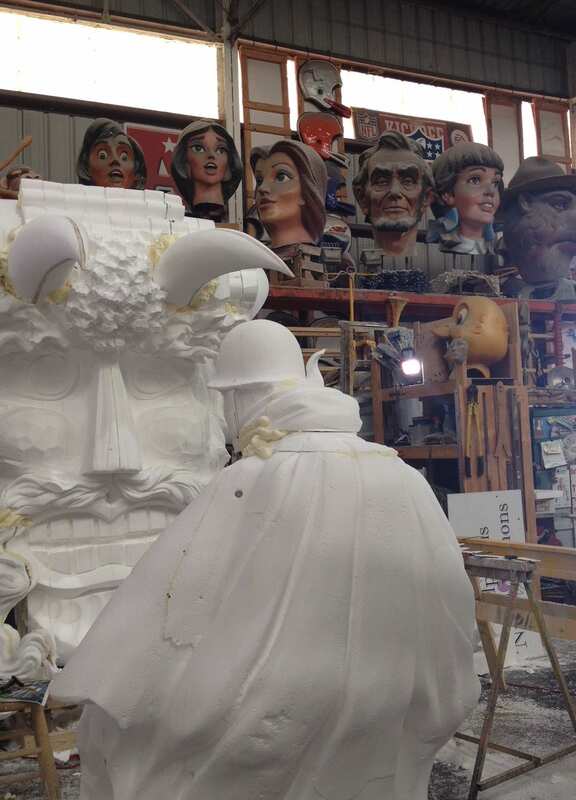 Among these larger-than-life sculpted scenes you’ll undoubtedly spot characters from history, comic books, fairytales and fables. Of course, New Orleans is also famous for its cuisine. Be sure to sample the Creole and Cajun dishes made with locally abundant ingredients and prepared using cooking techniques passed down and practiced by the people of the area’s different, mingling cultures. 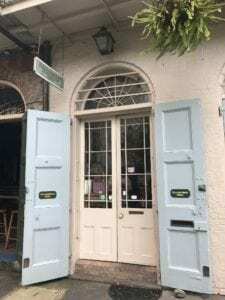 While New Orleans travel articles typically offer tips on where to find the best etouffee, jambalaya or gumbo, the specific focus of this blog series prompts me instead to mention establishments with names that give a nod to literature. 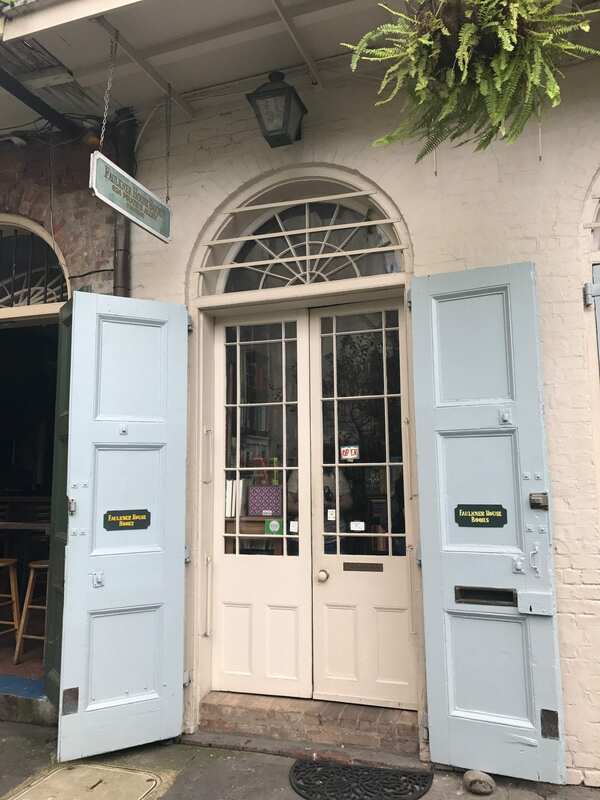 Evangeline restaurant (329 Decatur), presumably named after Longfellow’s epic poem about the Acadian heroine, and the Huck Finn Café (135 Decatur) are some I have come across – although the Huck Finn Cafe, it seems, may have recently changed names. The bustling street scene is another tourist draw. Street performers of all kinds sing, play instruments or pound a beat on buckets on French Quarter street corners. 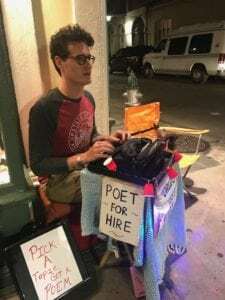 One brand of busker that caught me by surprise, however, was a young man who proclaimed himself to be the “World’s Okayest Poet” and who set up his tiny pop-up enterprise at the corner of Rue Royale and Rue Toulouse. Lights made of red plastic cups encircled his small, cloth-covered table on which rested a typewriter. After I requested a poem, the young man introduced himself as Cory. “The organic nature of it is what tickles me,” Cory said of the impromptu art he creates. 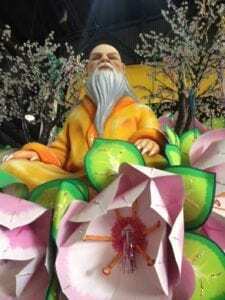 He also shared his thoughts on the satisfaction he finds in adding to someone’s experience and memories of New Orleans. Visitors have told him they framed his typed, in-the-moment poem as a cherished memento of their trip. With his permission, I snapped some photos of the poet at work. What holds more hints of life stories (and death stories, for that matter) than a cemetery? New Orleans’s high water table led, in part, to the practice of above-the-ground entombment for the deceased instead of traditional burial sites marked by gravestones, giving the area’s cemeteries a very distinct look. I booked a spot on a group tour of St. Louis Cemetery No. 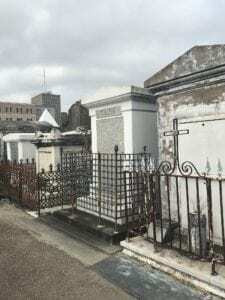 1 with Save Our Cemeteries, a non-profit dedicated to the preservation and promotion of New Orleans’s historic cemeteries (some online sites suggest that due to the possibility of criminal activity, it is safest to explore cemeteries with tour groups). 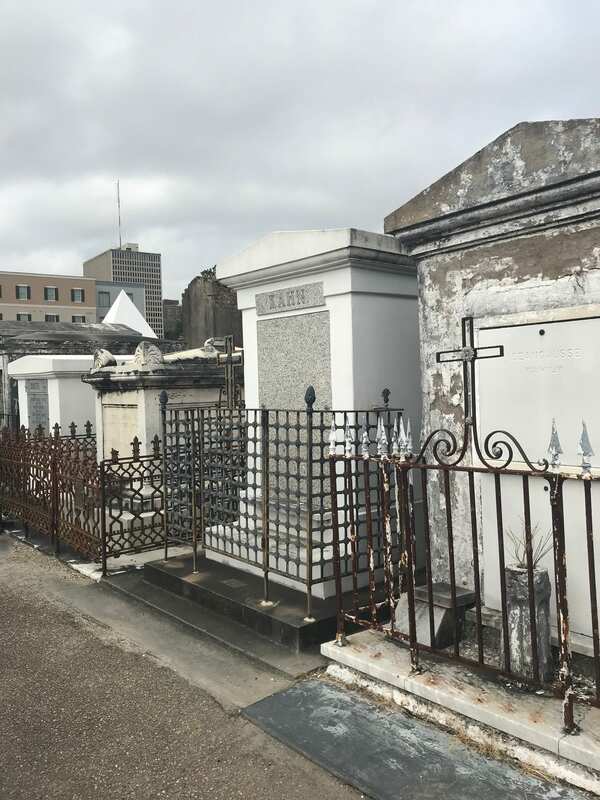 Our knowledgeable guide shared fascinating information about entombment practices of the area and the famous people who were laid to rest there, including Chess champion Paul Morphy, Homer Plessy of the Supreme Court civil rights case Plessy vs. Ferguson and, reportedly, Voodoo Queen Marie La Veau. One still empty, pyramid-shaped tomb in that cemetery is, we were told, the property of actor Nicolas Cage. New Orleans is the site of several art, history and culture museums, as well as some more unusual museums. As three of my children’s picture books involve bugs, I could not resist a visit to the Audubon Butterfly Garden and Insectarium. The Insectarium offers plenty of fascinating exhibits, many which feature live bugs. I grabbed a snack at the museum’s Tiny Termite Cafe, and it took me awhile to notice there were live beetles on display beneath the clear-covering of the restaurant table. 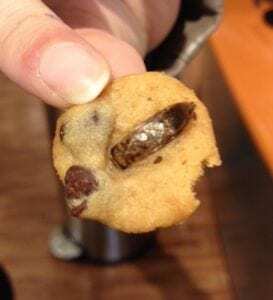 There’s also a separate area in the Insectarium, the Bug Appetit section, offering samples of delicacies not found on most menus – “Chocolate Chirp Cookies” (chocolate chips cookies with roasted crickets) “Six-Legged Salsa” (tomato salsa with crab-boiled mealworms) and “Cinnamon Bug Crunch” (fried waxworms with cinnamon and sugar) were among the offerings. Since I also number a WWII historical fiction picture book among my titles, I couldn’t miss the WWII Museum. I highly recommend a visit to this stirring and extremely well done museum for everyone, but it would truly be a rich source of research material for any writer whose work-in-progress takes place during the 1940s. 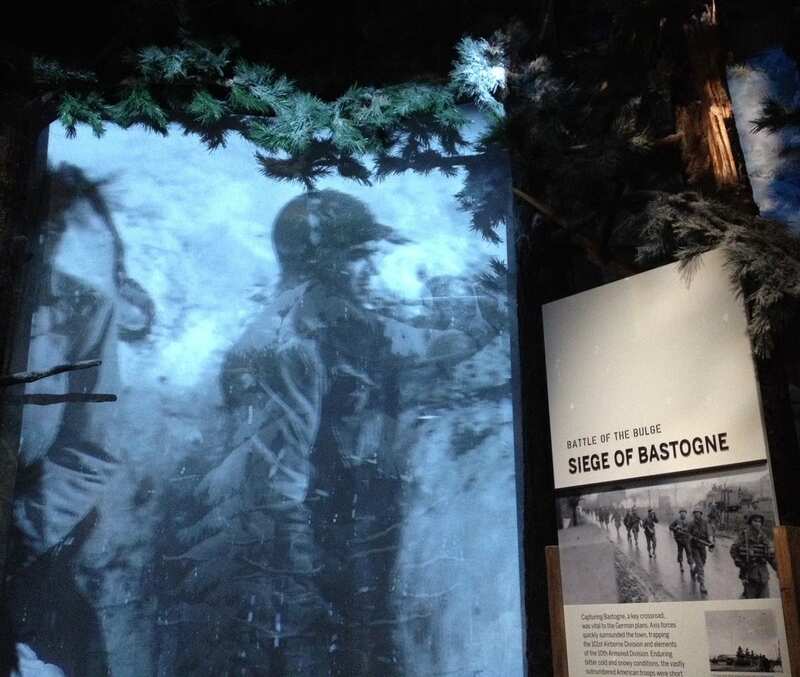 The exhibits explore many aspects of this era when the world was at war, from the battlefields to life on the home front. And now, a bit about bookstores. 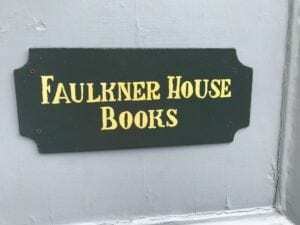 I found Faulkner House Books (624 Pirate Alley) listed in a visitor’s guide and sought it out one sunny day. 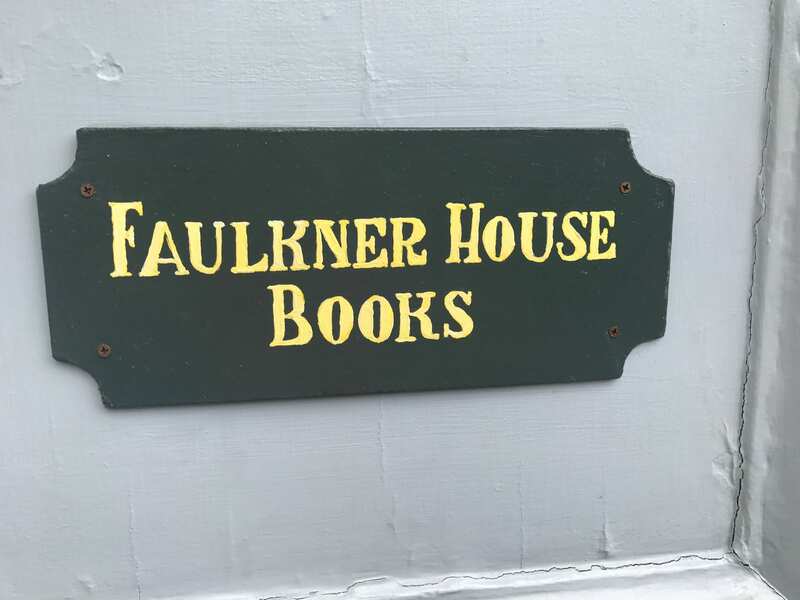 A plaque on the outside notes that William Faulkner wrote his first novel, Soldiers’ Pay, there in 1925. Inside the shop, a kindly staff member graciously answered my questions about Faulkner’s former residence. She shared that it was a boarding house at the time, and told me he had passed through the door I had come through. In this small, chandelier-lit shop, the books are obviously carefully selected and of a great variety. After asking for permission to take photos, I mentioned I was a children’s writer. She directed me to a small selection of classics – Huckleberry Finn, Where the Wild Things Are, Little Women and others. The staff member also gave me a small flyer titled The Antiquarian & Second-Hand Bookshops of New Orleans that listed several books shops specializing in different literary offerings. I appreciated this spirit of mutual promotion and support among the city’s indie book stores. One shop that appeared on the list happened to be close by my hotel. 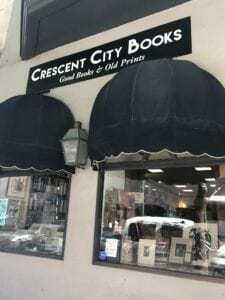 Crescent City Books (124 Baronne St.) proved to be a treasure trove of used books, and I selected and purchased two on a topic I was currently researching. 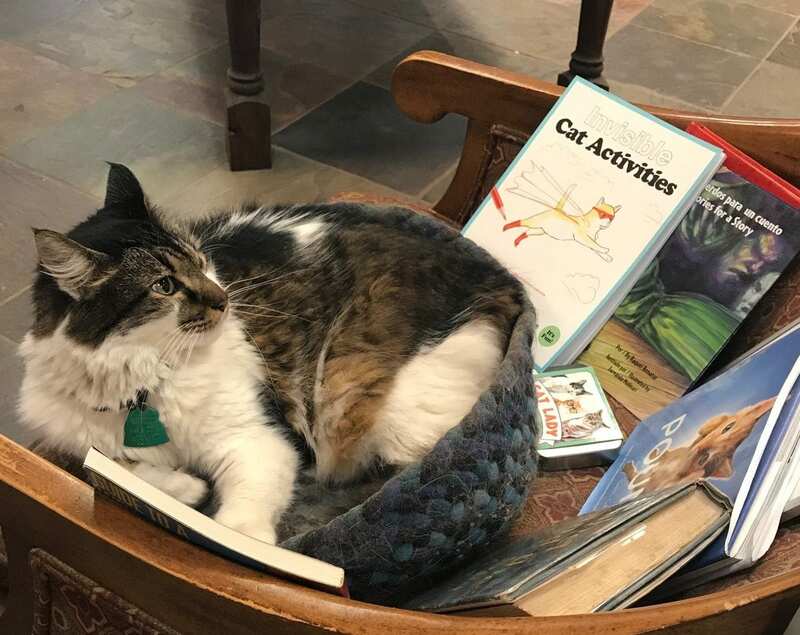 Also, I met the shop cat, curled in a chair surrounded by cat-themed books. 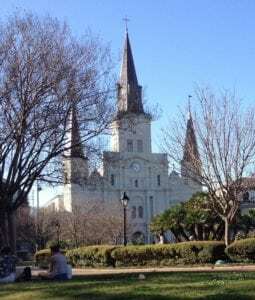 Despite my frequent visits to New Orleans, there’s still much I have yet to explore – the New Orleans Jazz Historical National Park, the St. Louis Cathedral, and nine more bookstores on the indie book list, to name a few. Without question, there are many more stories to experience in this lively, historic city, and much to inspire the future works of writers and storytellers of all kinds. Cajun/Creole Cooking – Several establishments offer Cajun and Creole cooking classes. I experienced and enjoyed an afternoon demonstration class offered by the New Orleans School of Cooking (neworleansschoolofcooking.com), 524 St. Louis St.
Insects – The Audubon Butterfly Garden and Insectarium (www.audobonnatureinstitute.org/insectarium), 423 Canal St.
New Orleans History – Jean Lafitte National Historical Park and Preserve French Quarter Visitor Center (www.nps.gov/jela/french-quarter-site.htm), 419 Decatur St.; Historic New Orleans Collection (www.hnoc.org), 535 Royal St. with a second campus and research library at 410 Chartres St.
World War II – The National WWII Museum (www.nationalww2museum.org), 945 Magazine St.